When my family traveled when I was a kid, we always stayed at local mom and pop hotels. These usually consisted of a long single-story building of hotel rooms, resembling a 1950’s ranch style house, with a parking spot in front of each room. Think Bate’s Motel, only clean, nice, and not inhabited by psychopathic killers. There were few amenities in these rooms: two double beds (nobody had queen-sized beds back then) with chenille bedspreads, a black and white TV, a small bath with a shower inside the tub, and if we were very lucky, air conditioning. They gave you the Lilliputian bar of soap, but no little bottles of shampoo or lotion. But the one amenity that was always included, was a slot in the bathroom wall or inside the medicine cabinet that proclaimed “Deposit used blades here.” The slot was just big enough to drop in a double-edged, old-fashioned razor blade, the kind almost no one uses any more. As a child I found these slots fascinating, causing me to raise all sorts of questions. 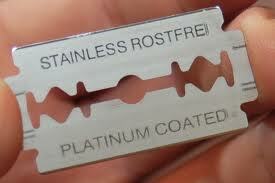 Where did the razor blade go once you dropped it in the slot? Was there a box behind the wall to collect them, or did they just fall behind the plaster, in between the studs and lathe, until the wall filled up with razor blades? And if there was a box to collect them, what did they do when the box filled up? Did they have to knock a hole in the plaster, empty the box, and then patch up the wall and seal it up again? Would I one day open the medicine cabinet in the Bate’s Motel and find razor blades spilling out, onto the shocking pink sink, littering the black and white tiled floor with rusty used blades? And what were they thinking anyway? Who decided that dropping razor blades inside the wall was a good idea to begin with? It’s not safe to carry used razor blades around in your travel bag, or put them in the wastebasket, but it’s perfectly okay to put them inside the WALL? What caused me even more chagrin was the fact that my parents and older sister did not find the razor blade slot in the wall nearly as alarming and interesting as I did.” But where do the blades gooooo?” I’d wail to my dad as he dropped his used blade into the wall. “What will happen if the wall gets filled up?” But no one shared my alarm or interest. “Don’t worry about it, they’ll take care of it,” my parents would always say. But I knew that wasn’t true. Grownups hadn’t done a very good job keeping the communists out of Cuba, or protecting our president from getting shot. If they couldn’t manage those very important things, how could they possibly care enough to keep travelers safe from razor blades? Yes, thank goodness they solved THAT. This entry was posted in Satire Friday and tagged double-edged razor blades, Humor, mom and pop hotels, satire, travel by Huffygirl. Bookmark the permalink. Well, that is certainly esoteric subject matter. We never stayed in motels as a kid–didn’t travel much–so I never got a chance to be fascinated by this bizarre convenience (??). Thanks for the laugh and sorting it all out!! Bizarre is right. If you’re lucky though, if you’re ever in a home built in the 1950’s to 70’s, you might find one of these slots in the medicine cabinet. I think there was a time when they were standard on those plain mirror-doored medicine cabinets. I had forgotten all about this! Now you’ve got me wondering . . . .
By the way, in France the bathrooms have “needle disposal” containers on the walls. I didn’t even want to think about that one too much. Yech! Not just superfund, but biohazzard. But thank goodness, if I ever travel in France, I can rest assured that I’ll have a way to dispose of my needles! I’ve always wondered about that, too! Not that you see the slots very often these days, but they do spark curiosity. By the way, Oliver saw the picture of the pile of razor blades on the computer and asked what they were. I told him, “It’s a pile of razor blades.” He replied, “Razor blades? Will the workers clean them up?” Excellent question, my little friend…he hit the nail on the head. I think razor blades inside the wall now a days would be considered akin to a superfund site. Good for Oliver – such a bright little boy to be reading Aunt Donna’s blog already. Mom and pop means simple, locally owned, as opposed to chain hotels, which most of the ones around here area now. Oh this is a good post…funny, nostalgic, and full of common sense. It brought back memories of my own touring on speaking engagements. You have described these motels so well…and yes, the razor blade disposal slot as well. I never questioned them though. To me, they were part of the amenities, along with the wonderful TV, black and white though it may have been. Thanks Sandra. In a way, I miss those simple old motels. They were always very clean, and so plain and simple that it felt a lot like being at home. 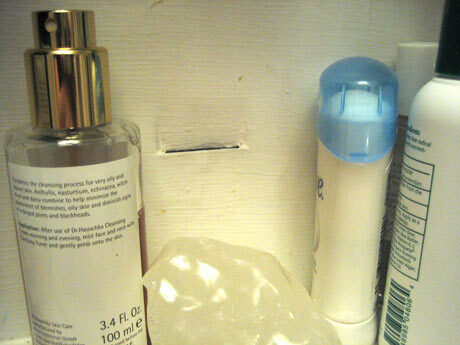 The medicine cabinet in my parents’ house had that little slot. I haven’t seen one for years. I hope you’ve been faithfully dropping your blades in Steve. Maybe, hotels thought it was safer to put razor blades in the wall… as opposed to putting them in the wastebasket where a cleaning person could get cut while emptying the trash. In any case, somebody is going to have to deal with all of those razor blades in the walls someday. I guess that’s the part that amazed me the most – that no one thought about the wall getting filled up with razor blades. When I was looking for photos for this, I found stories from people who were doing remodeling who opened up a wall to find it completely filled up with razor blades. This is a very interesting subject Donna. I am going to ask my brother if he remembers those slots and his thoughts on the subject. If he’s old enough, he may have some interesting memories too. Yes…our house was built in 1960, and still had what I think was the original medicine cabinet when we moved in. Sure enough, it had a razor blade slot! Now you have me wondering…I have to ask around and see if anybody here knows Where The Razor Blades Went. Maybe there was a teeny tiny Jetsons disintegrator ray inside the wall – that sounds at least as reasonable as letting the blades pile up between the studs, doesn’t it? Oops – just read the previous post – so they really did just pile up in the wall. Where’s a disintegrator ray when you need one? I think the people who have done remodeling and opened up a wall to find it full of disgusting razor blades, probably WISH there had been a disintegrating ray! Coincidentally, my husband seems to have stepped back int time and started using an old-fashioned double-edged razor. Given we don’t have a slot, I wonder where he’ll deposit the blades? Well, you could make your own slot in the wall, and then you’d have something to write about later. But I think the blades now come with a slot in the dispenser case where you can slide in the old blades. But what fun is that, when you could be using them to insulate your wall instead? Donna, re your last reply…true, but then I know women like that as well! I never noticed those slots when we were traveling. I guess I wasn’t very observant. I found this very interesting. And very funny! Thanks Susan. If you are ever in an out of the way place where they still have those old motels, maybe you’ll see one. Funny, so funny, yet so true. It is the small details that grab our attention! Your prose is eloquent and endearing. Why thank you Diane and thanks for stopping in. ROFL!! I can’t tell you how many times I’ve wondered about the very same thing. What’s disturbing is we still don’t know. I once made my husband hike up a mountain to find the source of the water trickling down it. We never got as far as we needed to for the answer. I need to know things like this. These questions keep me up late at night. We must be alike in that respect Margaret. We want to know why and aren’t happy if we don’t. I’m always looking for the mystery – how did it get there? who thought of it? what happens to it? Part of me wants to spin everything into a novel too. The razor blades inside the wall are hiding the murder weapon maybe. Who would think to sift through all the used razor blades to look for it? OOOH! What a great idea! Interesting story Laurie, and proves my theory that no one ever thought that the razor blades could fill up the wall when they put these slots in. 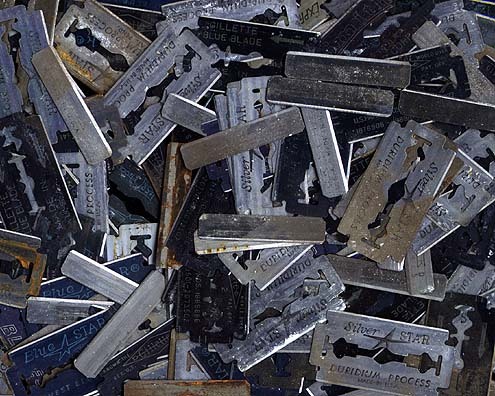 I imagine that anyone not old enough to have known about the razor blade slots in the medicine cabinets, who opened up a wall to find it full of razor blades, might be terrified. Thanks for stopping by and sharing your story. A friend of mine just sent me a link to your blog. Bc as it so happens I am remodeling a house I just bought and just so happens behind the wall in the bathroom were quite a few razor blades. If I could post a picture in the comment section I would. I’d love to see your photo Colin. Maybe you could post it on your own blog and I’d add the link to my original post, or with your permission, could copy the photo to my post here. Hope your remodel goes well, and glad you stopped by. Wonderfully written – brought back great memories of traveling with my family. I also remember wondering where these blades landed. Did they travel down, down, down… many floors and land in a dumpster? Like a dirty close drop! Did they just stay in the wall forever? I’m glad to know our little minds were busy processing and thinking. So sweet! Thanks Cristie. They did end up just inside the wall forever. Hard to believe anyone thought it was a good idea. Thanks for stopping by. I just installed a little wall plate for disposing of razor blades in one of the bathroom walls in my home. I considered other solutions, but this is safest. If I travel, I’m unlikely to need more than one blade, but if I did, I’d use a steel tin to store the old blades.